P10 LED panels are pre-made pixel panels with a 10mm pixel spacing, which is what the 10 in P10 indicates. The P10 panels daisy chain from 1 to the next via a 16 way IDC cable. They are powered by a figure 8 cable running 5V DC. 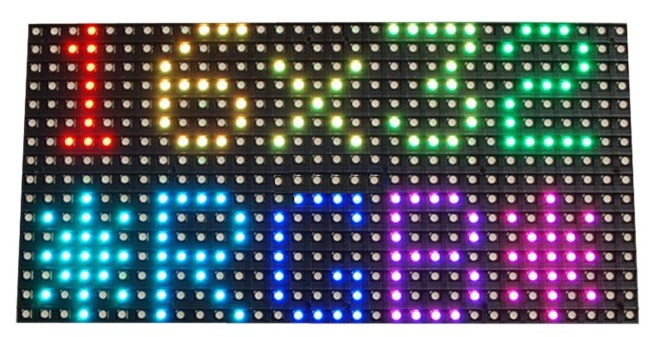 The 32×16 RGB panels are a HUB75 (1/8 scan) interface. 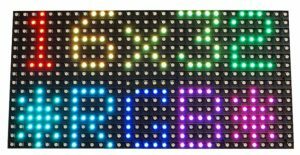 It is the HUB75 RGB, 320mm x 160mm, 32 pixel x 16 pixel panel that is commonly used for Christmas displays. 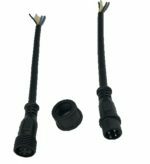 Supplied with magnet mounting screws, 1 x IDC16 interconnect cable and 1 x Power cable. Note:- The supplied IDC16 cables are long enough for joining end to end horizontally but not long enough to join from 1 horizontal row to the next. Additional cable and connectors are required to do this. Requires something like a Beaglebone Black and Octoscrolla or Raspberry Pi and rpi-P10 to run it. Each panel has 512 RGB leds and uses 3 universes of DMX data. See http://auschristmaslighting.com/wiki/P10_Led_Panels for further information on P10 panels.